Found abandoned in the jungle, the baby boy Mowgli is adopted by a pack of wolves and taught the Jungle Law by Baloo the bear. But Shere Khan, the terrifying tiger, is determined to kill the boy and Mowgli will need all his bravery and trickery – as well as help from his jungle friends – if he is to survive. 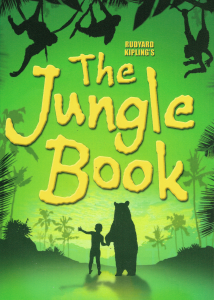 Stuart Paterson’s adaptation of Rudyard Kipling’s classic tale combines heart-stopping danger with excitement, fun and of course some catchy songs , with new music by BB Cooper, lyrics by Rudyard Kipling and additional lyrics by Barb Jungr. Performances will take place on Friday May 5th, Saturday May 6th, Friday May 12th and Saturday May 13th at Archbishop Sancroft High School, Harleston. Tickets available from early April at Robinson’s Traditional Stationers, by telephone 01379 855027, and online from this website. For more information, contact Mike Davison – mudracemike@yahoo.co.uk. Youth Theatre – what will be next? The next Youth Theatre production will be taking place this autumn, and will be directed by Tony Winn. Rehearsals will begin in September. Tony will be considering a number of scripts; we’ll post information about which show he chooses as soon as we can, so watch this space!